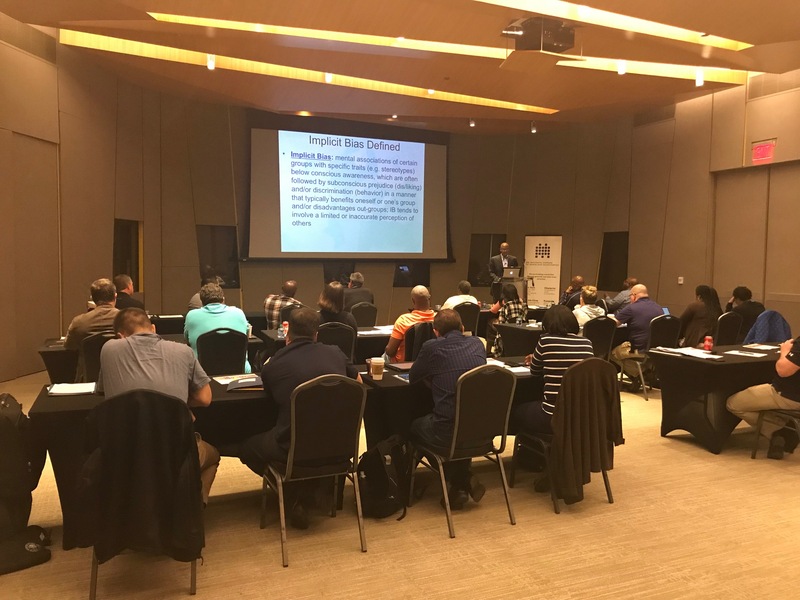 On Thursday, April 12 and Friday, April 13, 2018, the Auschwitz Institute for Peace and Reconciliation (AIPR) held the second annual edition of the National Seminar for Law Enforcement on Promoting and Protecting Civil and Human Rights in Atlanta, Georgia. 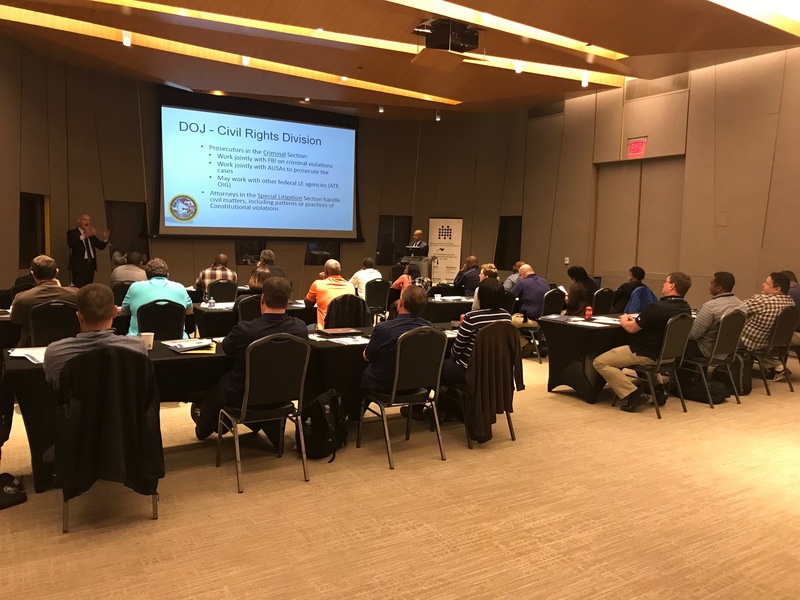 In collaboration with the National Center for Civil and Human Rights (National Center) and the U.S. Federal Bureau of Investigation, AIPR welcomed 24 participating police officers from departments across the United States to the National Center for the two-day training. The training seminar is premised on an understanding that threats to civil and human rights can, if unchecked, become part of an escalating process of destruction that may lead to mass atrocity. With this in mind, the seminar curriculum was designed to promote three specific objectives. First, the program worked to instill in participants the value of promoting and protecting civil and human rights and of examining the factors which put societies at risk for violating those rights. Second, it highlighted the ways in which the promotion and protection of civil and human rights by law enforcement plays a specific and important role in the prevention of mass atrocities. Third, it explored the application of lessons learned through the previous two objectives to the challenges faced by police today in serving multicultural communities in a deeply divided society. The first day of the seminar opened with a series of introductory remarks from Samantha Capicotto, AIPR’s Director of Policy and Planning, Brian Tolleson, Interim Chief Executive Officer at the National Center for Civil and Human Rights, Matthew Alcoke, Assistant Special Agent in Charge at the Atlanta Field Office of the U.S. Federal Bureau of Investigation (FBI), and Dr. James Waller, Director of Academic Programs at AIPR and Cohen Professor of Holocaust and Genocide Studies at Keene State College. After his introductory remarks, Dr. Waller presented the seminar’s first module, during which participants considered the characteristics of “deeply divided societies,” how they increase the risk of genocide, and the continuum of prevention strategies that can be employed to prevent mass atrocities from taking place. Next, participants were given a comprehensive guided tour of the National Center, which highlighted its permanent exhibits which link the American Civil Rights Movement with the fight for global human rights. Participants then had a working lunch, offering them an opportunity to debrief from the museum experience and contextualize it within the broader objectives of the event. Dr. Waller then joined with Aimee Richardson-Zadra, Supervisory Special Agent with the FBI’s International Human Rights Unit and Lisa Koven, Chief of the Human Rights Law Section of the Human Rights Violators & War Crimes Center of US Immigration and Customs Enforcement (ICE) to deliver a module on the promotion of civil and human rights within post-atrocity immigrant and refugee communities. The day then closed with Dr. Waller’s signature “Becoming Evil” module, which analyzes the behavior of perpetrators and underscores the process by which individuals become capable of carrying out mass atrocities. The second day of the program began with a short set of welcoming remarks by Dr. Waller ahead of the event’s Keynote Address, which was given by Dr. Cedric L. Alexander, Deputy Mayor of Rochester, New York and member of President Obama’s Task Force on 21st Century Policing. Dr. Alexander’s remarks centered on the need for the law enforcement community to constantly reflect on the values it holds and to acknowledge its own ability to act as a force for positive reform on issues and policies related to policing in multicultural communities. The next module was presented by Dr. Bryant T. Marks, the Founder and Principal Trainer with the National Training Institute on Race and Equity and Professor of Psychology at Morehouse College. Dr. Marks led a module dedicated to unpacking implicit bias in policing practices. His module included an interactive component, giving participants an opportunity to consider their own potential biases. 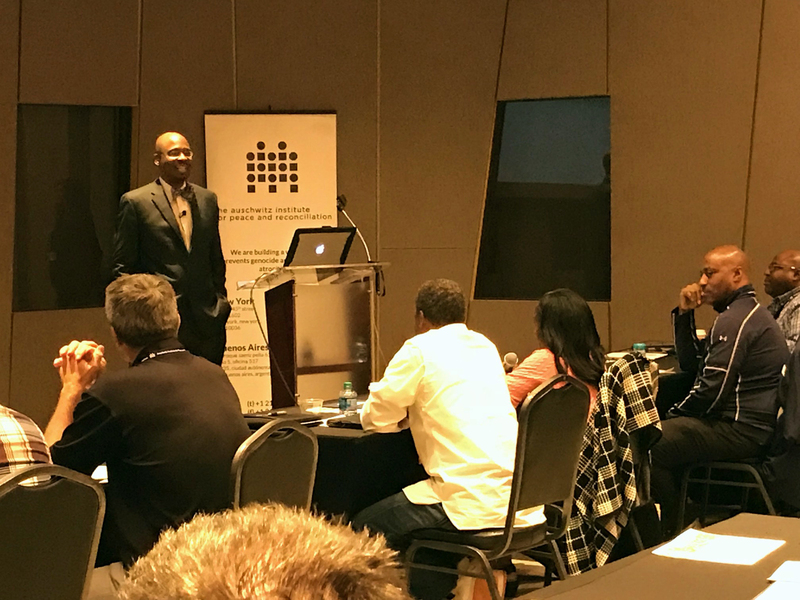 The final module of the seminar was led by Mr. Ramon Johnson, Supervisory Special Agent with the FBI’s Civil Rights Unit and Mr. Brent A. Gray, an Assistant U.S. Attorney working at the U.S. Department of Justice’s offices in the Northern District of Georgia. The module served as an introduction to Federal hate crimes law and Color of Law investigations conducted by the Department of Justice. The 2018 National Seminar for Law Enforcement on Promoting and Protecting Civil and Human Rights built on the foundations laid by the pilot edition, with the participant evaluations from the previous year playing a fundamental role in the continued development of the curriculum. The growth of the program was also evident in the expanded number of participating police precincts across the country, enhancing the seminar’s interactive modules through increased diversity of perspectives and experiences. The Auschwitz Institute notes the success of the seminar, commends the commitment displayed by attending officers, and looks forward to continuing to grow the initiative in 2019.